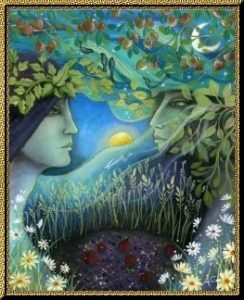 Lugnasadh (pronounced Loo’-na-sah) is the Celtic festival dedicated to the God Lugh, the Long Handed, who is associated with light and fire. he festival is also considered to be the first harvest, the harvest of the grain, and is linked to the God (or Spirit) of the Corn. Summer is at it height, but already the days are growing shorter and we know that autumn is on its way. This is the season to think about our hopes and fears. We hope that we will be able to pick and eat all the things we worked so hard to grow – but a lot could still happen, storms, drought. To harvest we must cut down the plants we have tended so carefully. We mourn and grieve for the spirit of the grain. We honor them because they give us life. This is the season that the Goddess becomes the Mother of the Harvest. She is strong, her face dark from the sun and wind. he carries a scythe and a basket of fruits, vegetables and ears of corn. She knows that in order to eat bread we must cut the grain. In fact, is we didn’t cut it, it would die anyway, for that is the only way next year’s grain can grow. We can call on the Harvest Mother when we have difficult decisions to make or hard tasks to perform. We must face our fears of failing, of losing the harvest, or making mistakes. She gives us the strength to do what must be done, to tell the truth, even when it hurts, and to say no to things that are not right. She loves us, her children, and her gifts are food, abundance, and plenty. Everything we need to live and grow. She is hope as well as fear. When there is something special we hope for, we can ask her help. But, remember, she expects us to work for what we want! We honor the Harvest Mother whenever we don’t take the easy way out, when we do what is right, when we face fear and continue on ahead, when we work hard and wait patiently for rewards. The God of this season is Lugh (Loo). He is also called Samildanach – the Many Skilled. He is the God of all the arts and skills. At this time of year, when we can feel the sun begin to wane and the days grow shorter we say the God is already halfway into the Otherworld. He is in the realm where ideas are born, where dreams and inspiration come from Spirit and be brought into our world of day and night by our work, our skill and our art. In his honor, games in champions would test their skills and strength were held by the ancients. Lugh is also a sun God. He is called Lugh of the Long Hand or Long Arm – the long rays of the sun as it sinks lower in the sky at this time of year. He is always reaching out to us with warmth and comfort. We can feel close to the God at this season by practicing our skills, making art, playing music. The Altar should have on it some of the first fruits, grains, and Vegetables that are now ripening. You can add things that represent your skills: a book, a drawing, even a hammer! Bread you have baked in the figure of the Sun or a man (to represent the God) could also be used for the Simple Feast during ritual. Corn Dollies, symbolic of the Goddess, are appropriate as well. One section of the altar can represent your hopes. Look for pictures in magazines and make a hope card. Another section of the altar can be for your fears. Draw pictures of them, fold them up, and, as part of your ritual, burn the pictures and release your fears. Have you and/or your ancestors been part of a struggle for justice? What struggles going on in the world right now could use some help from Lugh’s spear? Put something on the altar to represent those struggles. Although we still see green, for the fields and trees have reached their full spectrum of foliage, the focus is in the yellows and golds of the corn, and the black of the Dark Mother. Bone and Tan accent this holiday nicely. Incenses for Lugnasadh include frankincense, sandalwood, copal and heather. Woods connected with this Sabbat include Grape Vine, Hazel and Oak.